Professional sports mascots bring joy wherever they go, no matter if it's a charity event or a random appearance at the mall's new Sunglass Hut. It's in the job description — via fur, excitement, and trampoline-aided athleticism, they put smiles on the faces of children and adults alike. Imagine, then, that a mascot appeared at one of the most joyous events possible: a wedding. Wouldn't that elevate it to a whole new plane of amazing? Well, imagine no more! 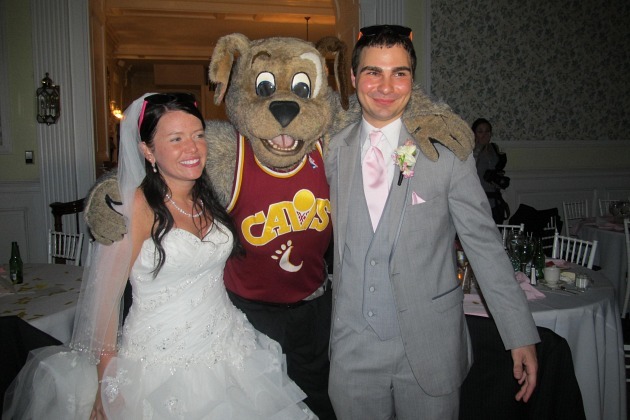 This Saturday, Cleveland Cavaliers mascot Moondog, a giant happy dog, attended the nuptials of Cavs fans Ashlee and Ben. As these photos show (via TBJ and Ananth Pandian), it was an amazing experience. Join us after the jump for a look at the full Moondog wedding experience. Wait, is that cake chocolate? Someone stop Moondog before he does something irreversible! When you're a giant dog with a constant expression of happiness, it's important to realize that you'll look drunk regardless of circumstances. 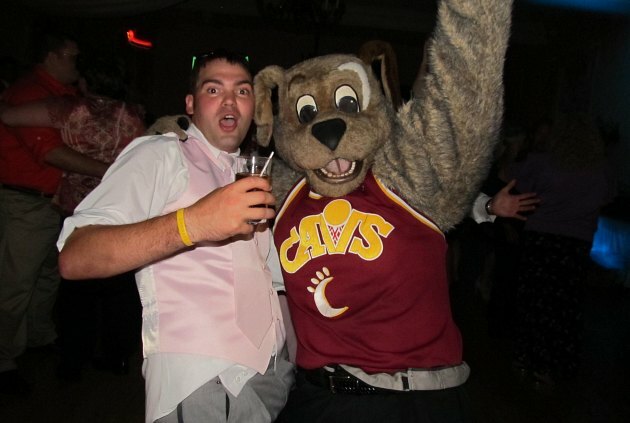 Big ups to Moondog for finding the real drunkest person at the wedding to avoid full-on embarrassment. This is the most adorable photo ever taken. 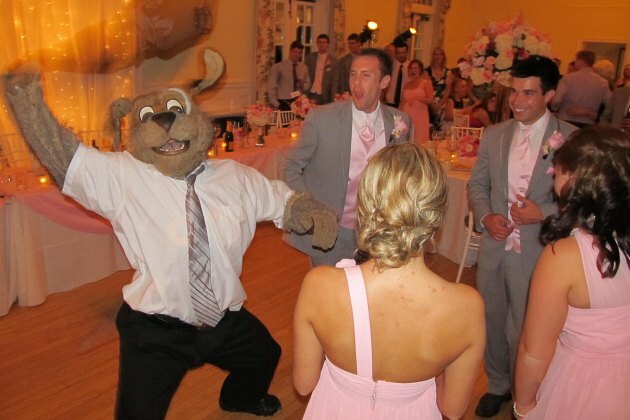 An average mascot would rest on his laurels, show up at the wedding in his usual gear, and assume he didn't have to prepare any new material to show people a good time. But Moondog is a true pro, and he knew that wedding-specific jokes would really bring down the house. So here he is in the classic late-wedding outfit of a shirt and tie without the jacket, complete with hard-charging, time-of-his-life dancing. 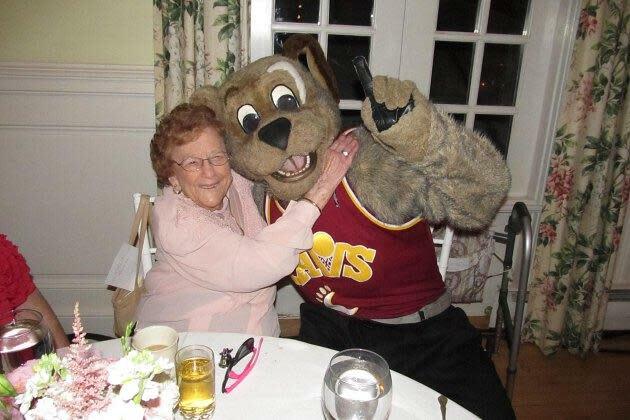 Moondog sets a high bar for every other mascot, my friends. There's even more amazingness at Moondog's Flickr account. We wish Ashlee and Ben best of luck in their life together. 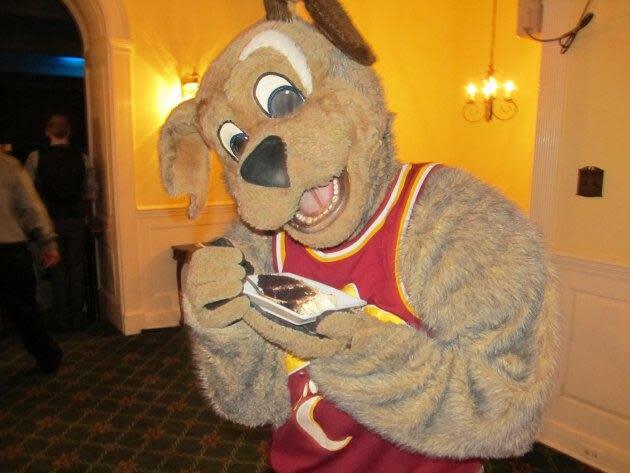 Hopefully Moondog can make their child's first birthday party, too.